Unlike the iPhone and iPod touch, the iPad was designed with the needs of typists in mind. The screen size, the large virtual keyboard in landscape orientation, and the support for external keyboards make the iPad a natural choice for word processing on the go. For many people, that means reading, editing, and saving Microsoft Word files. Even though there’s no iPad version of Word, you can work with Word files on your iPad if you’re willing to accept a few compromises. Just need to read Microsoft Word documents? All you have to do is get the documents onto your iPad; Apple’s iOS can display them natively. For example, you can email documents to yourself as attachments, or use an app designed for transferring and viewing documents, such as Avatron Software’s $10 Air Sharing, Good.iWare’s $5 GoodReader for iPad, or Readdle’s $5 ReaddleDocs for iPad ( ). Editing your Word documents is a bit trickier. There are several good options, but all come with a qualification: they support only a subset of Word’s features. So, no matter which method you use, you may have to live without certain features—and in most cases, accept the loss of some formatting as well. 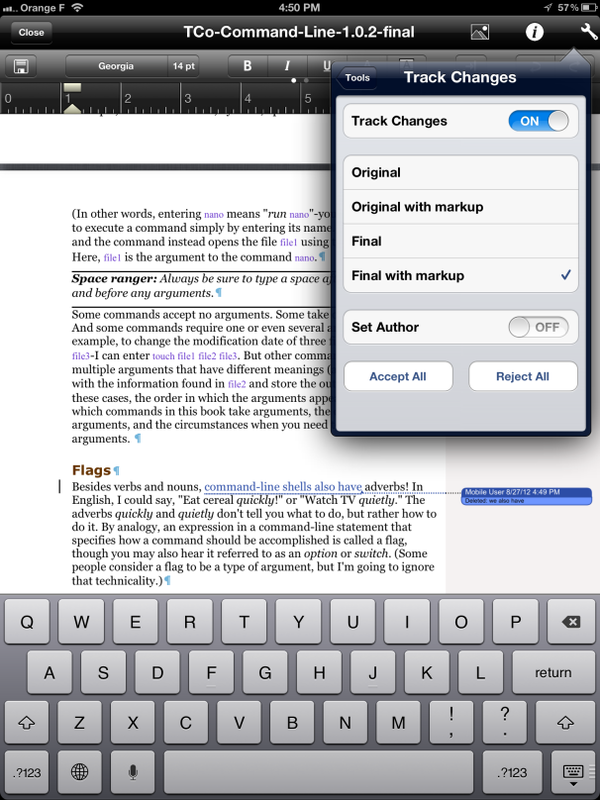 One easy option for editing Word documents is Apple’s $10 iWork app Pages ( ). It can import and export documents in Microsoft Word format, and offers a powerful and easy-to-use environment for creating and editing files. As long as you’re running OS X 10.8 Mountain Lion, using the latest version of Pages for Mac and iOS, and have an Apple iCloud account, transferring documents between a given app on your Mac(s) and iOS device(s) is simple thanks to iCloud’s Documents in the Cloud feature. Unfortunately, when you import a file in Microsoft Word format (.doc or .docx) or export a Pages file in a Word format, you permanently lose essential formatting, tracked changes, comments, and other file attributes. So, if you’re content to keep your Word docs in Pages format once they’re imported—or give up any unsupported formatting—the iWork apps are arguably your best choice. But if maintaining fidelity with the original formatting is your top priority when working with Word documents on an iPad, you’ll want to look for a third-party solution. Pages delivers a full range of word processing features with an interface optimized for the iPad. Another approach is to rely on Google Docs, Google’s free Web-based office suite. Many businesses have standardized on Google Docs because it’s a convenient platform that requires no software beyond a Web browser, provides automatic backups and versioning, and makes sharing files with co-workers easy. All of this would seem to be a good fit for the iPad, too. Unfortunately, though you can upload nearly any file to Google Docs, if you want to edit documents online, you must let Google Docs convert them to its own format. As with Pages, that may entail a considerable loss of formatting. For example, margins, table spacing, headers, and footers may change in undesirable ways, and custom paragraph and character styles may be lost. And, Google Docs can’t convert Word documents larger than 2MB. The latest version of Nikita Lutsenko’s $4 GoDocs, which offers editing and offline storage of Google Docs, lets you switch more easily between Google’s mobile and desktop views, but because it uses a built-in browser for editing documents online, its editing capabilities have the same limitations as in Safari. But that’s not the end of the story. You can edit your Word document on an iPad by using the native editors built into any of numerous other iPad apps that connect directly to Google Docs or other services. All five of the following all-in-one office suites for the iPad include word processing, spreadsheet, and presentation tools. They all can edit documents from Microsoft Word and offer direct ties to a variety of cloud-based services, including Google Docs and Dropbox, making it easy to get documents in and out. Documents To Go Premium DataViz’s Documents To Go Premium ($17; ) preserves nearly all formatting and document characteristics when you move files between the Mac and iPad. It also offers a good range of formatting controls. The app displays some imported elements, such as graphics and tables, without letting you edit them. Other elements, including named styles and paragraph borders and backgrounds, don’t appear at all but are still preserved when you save. Additional editing features include adjustable paragraph spacing, find and replace, and word count. Office² HD Byte Squared’s Office² HD ($8; ) preserves nearly all formatting and document characteristics during the round trip from Microsoft Word on a Mac to the iPad and back. It also offers a respectable range of formatting controls for word-processing documents, such as font, size, style, text and highlight color, alignment, indentation, and bulleted and numbered lists. You can adjust paragraph spacing; create multiple columns; add or edit tables and graphics; set page, column, and section breaks; set margins and tab stops; add footnotes and endnotes; check your spelling, and see your current word count. It also has a find (without replace) feature. Office² HD is the only one of the suites to fully support change tracking. A few predefined style names are recognized, but styles from imported documents can’t be edited. Office² HD can display, but not edit, document elements such as paragraph borders and background colors. 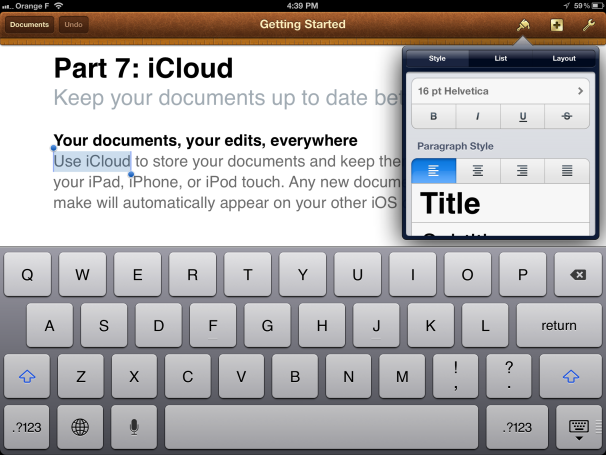 Office2 HD is unique among iOS word processors in fully supporting Word-style change tracking. The $6 Doc² HD from the same developer, has all these word-processing features without the spreadsheet or presentation capabilities. Polaris Office Infraware’s $13 Polaris Office includes a table editor and tools to add shapes, freeform lines, and other graphics to your documents. It also offers internal bookmarks and external hyperlinks, find and replace, page layout options, and somewhat awkward comment editing. Polaris Office leaves much formatting intact (including comments), but strips out or modifies other elements such that the edited document may not closely resemble the original. Quickoffice Pro HD Quickoffice’s Quickoffice Pro HD ($20; ) covers the basics and nicely preserves most formatting during the import-edit-export process, but offers little in the way of extra features—two exceptions include word count and find-and-replace. Senior contributor Joe Kissell is the senior editor of TidBits and the author of the ebook Take Control of Working with Your iPad, Second Edition (TidBITS Publishing, 2011).